Driving without thinking! Are we crazy or something? People die every day from car accidents involving others who are diving without conscious thought. After a spontaneous reaction like this I find myself driving with extra caution. Checking all my mirrors. Checking over my shoulders. Hyper alert! And this vigilance lasts all of a few minutes. Then I go back to my subconscious way of driving. But, I have found a way to combat this blasè way of driving. Get a scooter! AH! The warm sun. The wind on your face. Bugs–and I mean big bugs!–smacking into you. The fumes from big trucks washing over you. Vehicles kicking up dust and debris that lands in your mouth. Other drivers jumping out in traffic in front of you. Brakes that don’t stop on a dime. This experience will straighten out your view on driving. Three to four months out of the year I commute to and from work on a scooter. My commute isn’t long, maybe 25 minutes round trip. But I spend that time in a state of hyper awareness. I’m not intending to be morbid here, but I am so exposed to the elements and to other drivers that “Super Defensive Driving” becomes my motto. So let’s do some math. 25 minutes, 5 days a week, for 3 months. That’s 125 minutes a week and around 27 hours a season that I spend driving in this alert state. Then scooter season is over and I hop back in my car. And guess what? I do not go back to blasè driving. No sir! I have rewired my brain to be on alert when driving. I stop at every yellow and red light. I check for pedestrians or bicyclists at every intersection. 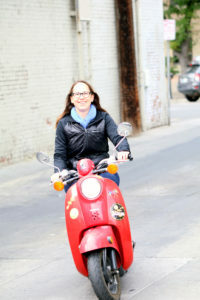 I pay careful attention to anyone on a motorcycle or scooter because I know how they feel. I follow the speed limit. I am a careful driver. I am a mindful driver. My family is not overly impressed with my definsive driving. It does take us longer to reach a destination when I’m driving. But reach it we do! And yes, I can recall if I stopped when I was supposed to at each point along the route. There is a dark side to this story. I’ve owned a scooter and driven it for several years now. But there is a point, during the 9 months I spend in my car, that I revert back to unconscious driving. You see, even though I can rewire my brain for alert driving, the wiring for unaware driving is still there. And the wiring for unconscious driving gets plenty of windshield time. Yes, I can still drive from Point A to Point B without conscious thought. But, for a few months out of the year, I have found a way to be more mindful while driving.